Project obstacles and solutions: The E.W. Brown Electrical Generating Station was required to update its coal ash dumping procedures due to new EPA regulations. Since the 1950s, ash was placed into a 105 acre wetlands area where it was contained in a pond. This ash storage pond backed up to Herrington Lake and there was a concern that if the ash pond's dam failed, contaminated water from the area could enter the lake. The wet ash pond was converted to a dry storage area with a liner to keep the coal ash from leaching into ground water. The water was pumped out of it. Charah then built three retaining ponds of 2, 3 and 5 acres to handle water runoff. They placed a liner across the basins of each pond. 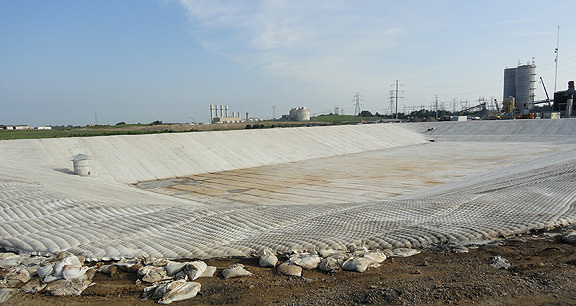 RTC Southern then covered this with Fabriform - a synthetic blanket that contains any water on the site. Within the blanket were pockets filled with flowable concrete. These served as a reinforcement for walls of the ponds as well as a protection for the liner. IMI supplied 10,000 yards of flowable fill for these pockets. For more information on flowable fills from IMI, click here.